Fresh from our first ChineseBites dinner at Golden Swan, we headed to our 2nd destination which coincidentally is located only a block away. 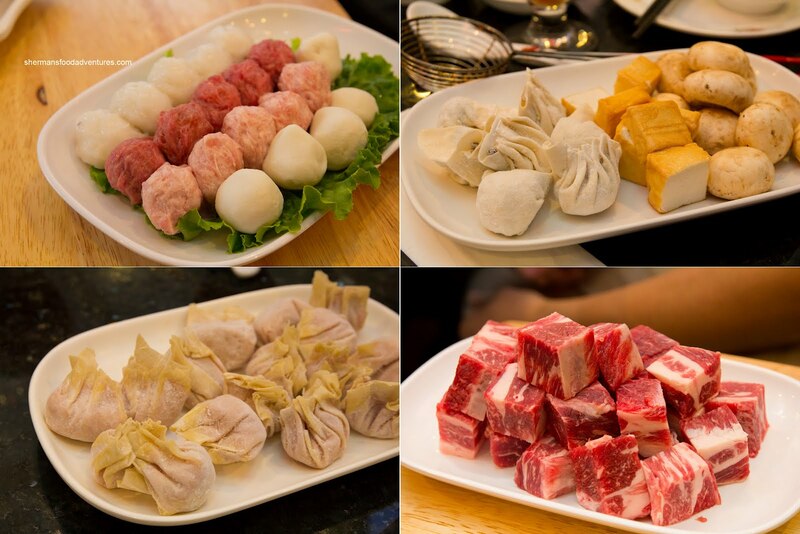 Generally, hot pot and Summer go together like a no-way stop and Richmond. However, with A/C and a group of fellow bloggers (Kevin, Rick, Alvin, Romina and Janice), we were committed to having a good time. The fact that it was comped would be another reason to not complain. As per usual, I won't comment on the service because it would naturally good (duh...). 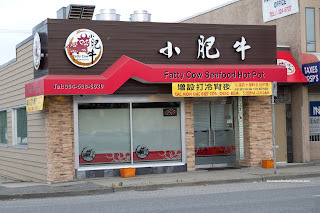 Now one thing I do know is, from my previous visit to Fatty Cow (which was on my own dime), the service was above average for a Chinese restaurant. For a hot pot joint, Fatty Cow is clean, modern and fully equipped. That means the restaurant is designed for hot pot with induction burners built into the tables with exhaust fans above. 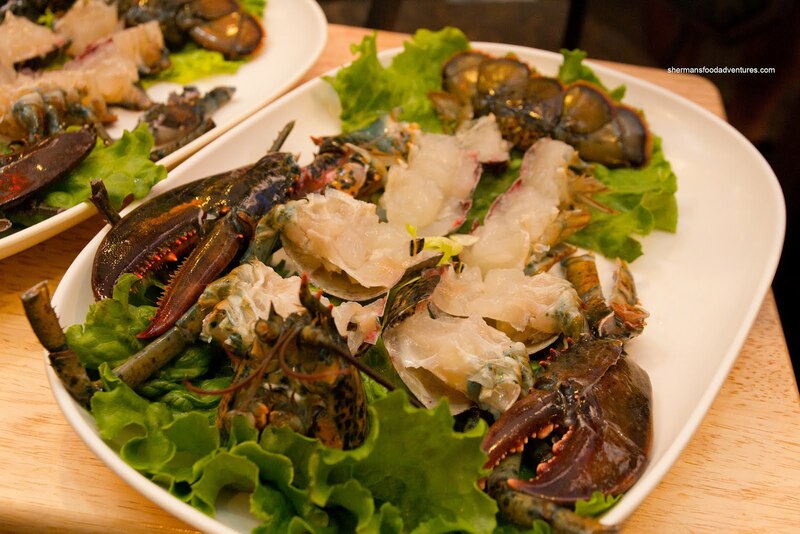 In addition to hot pot, they have a regular menu as well as late night until 1:00am. For our dinner tonight, it was strictly AYCE hot pot with a few "extras". 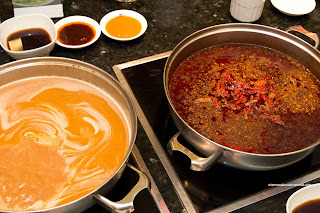 We decided to go with 2 different broths consisting of Peanut and Spicy Szechuan. For me personally, it was the spicy broth all the way where I really didn't even need to use any of the dipping sauces including the sweet & spicy soy which was laced with a pile of cilantro. The stuff came fast and furious starting with the meats consisting of Fatty Beef, Pork Belly, Pork Cheek and Rib-Eye. 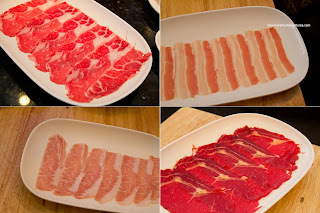 All were sliced thin and were not frozen. They were fresh in both colour, texture and taste. I particularly liked the pork cheek as it has a touch of chewiness. Being a "premium" hot pot joint, all their Meatballs are made in house. As a result, the meatballs are never frozen and obviously had a fresher taste and texture. However, overcooking them would essentially negate the freshness - better keep an eye on those balls! The Wontons and Sui Gau were also made in-house, but they were served frozen. This way, they did not stick together or become a complete mush while sitting on the plate waiting to be cooked. These were pretty good with a flavourful and meaty filling which was not-gritty. Something that was not really our favourite was the Frozen Cubed Beef. It was super chewy, even when barely cooked. 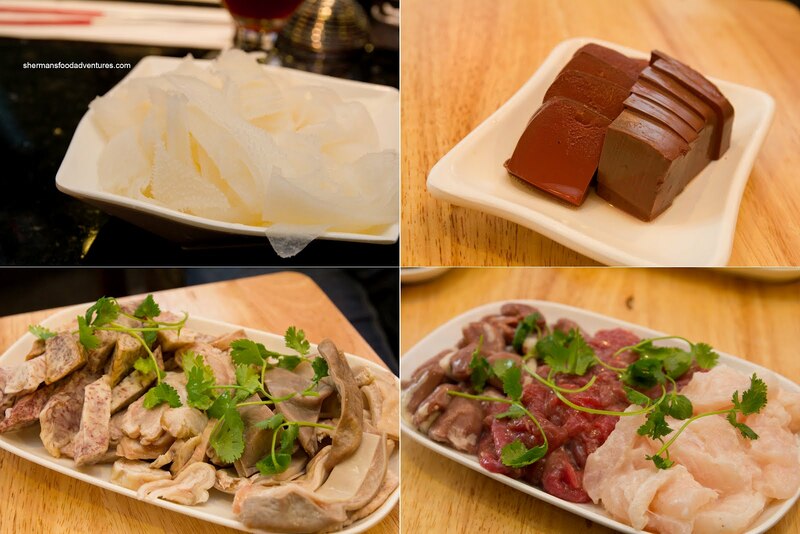 Now hot pot would not be complete without some offal right? At least for me! I gleefully checked off Omasan (bible tripe), Pig's Blood, Pig Intestine, Pig Stomach and Chicken Hearts. All were pretty much as I expected. I think I ended up eating most of it... On the same plate as the chicken hearts was Marinated Sliced Beef and Basa Slices. The beef was tender while the fish was flaky. 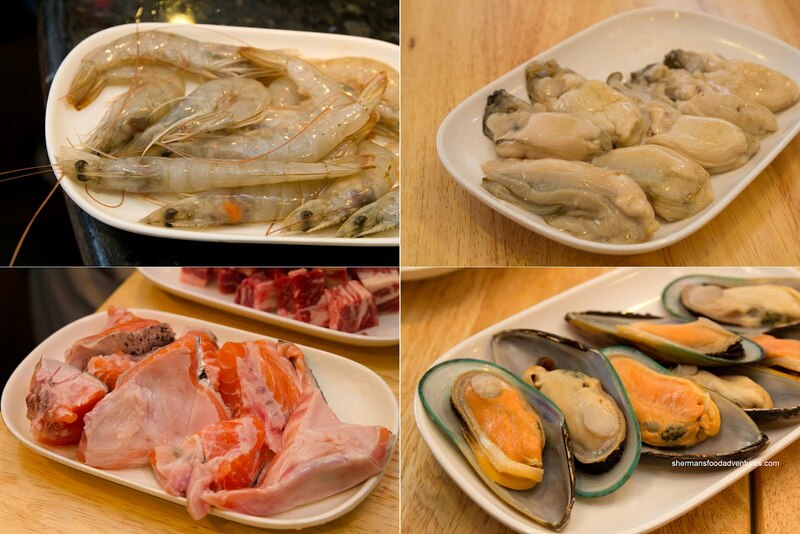 We also got a variety of seafood including previously frozen White Shrimp. These are pretty common at AYCE hot pot restaurants. They were fine for what they were. If cooked properly (just barely done), the meat would have a good snap while being sweet. Cook too long and the meat gets all chewy. Much like my last visit, the fresh Oysters were absolutely humungous. Even after cooking, they were still a chore to eat. The Salmon Trimmings were also fresh. Although these were boney and required some effort to eat, these are the best parts of a fish. The meat is generally fattier and remain moist even through overcooking. The Kiwi Mussels were the standard pre-cooked frozen variety. 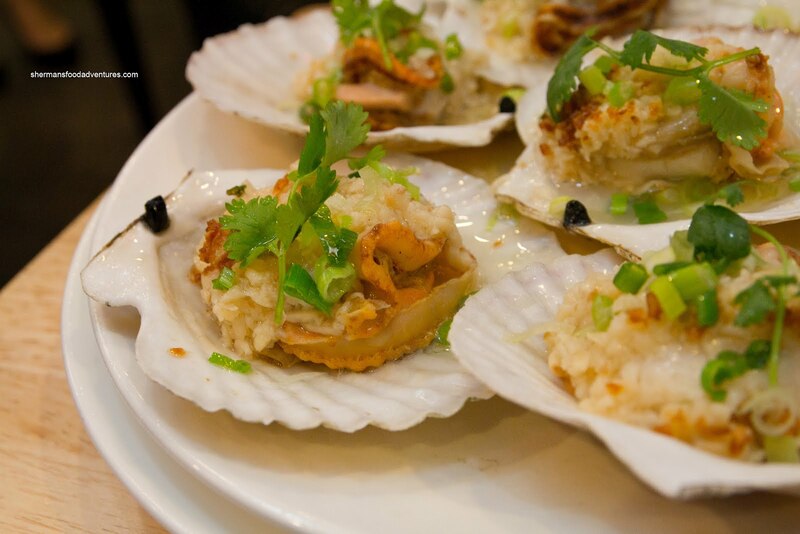 As a bonus, since we were invited to this meal, we were presented with some pretty large Steamed Live Scallops on the half-shell. These were a real treat because they are expensive and more importantly, they are naturally sweet with a wonderful texture - a bit chewy, yet not hard to eat. Lastly, as another treat, we got 2 live Lobsters! Yes, they were trying to impress, but could you blame them? And of course, it was a pleasure to eat since they were fresh. Of course this meal was above and beyond the regular AYCE menu, which made it extra special. However, based on my previous visit, the AYCE portion had not changed. The quality is still there and so are the other features that make Fatty Cow one of the better Hot Pot joints in town.